Dans ma tête cet avion étant un lointain dérivé des MD80 ... il avait sa place chez les "grands"
Quid du 717 alors ? La FAA procède en parallèle à une "shadow certfication", ce que je comprends être une surveillance et un contrôle de la certification chinoise. First delivery of the Commercial Aircraft Corporation of China (Comac) ARJ21 regional jet is likely to be delayed by up to a year or more, after problems surfaced during the flight testing programme. Sources close to the programme, who spoke on condition of anonymity, said the airframer is not likely to deliver the first aircraft to launch operator Chengdu Airlines by end-2011 as scheduled. A Comac spokesman was not able to comment on the reported delay. Chengdu Airlines was uncontactable for comment. Among the problems faced by the airframer is the incorrect positioning of aircraft probes which resulted in inaccurate readings during flight testing, said sources. The programme has also not completed its icing tests, said a source, adding that this makes it difficult for the ARJ21 to receive its type certificate by year-end. "There isn't much time left, the icing tests were supposed to be completed in the first half of this year but they were not," he added. Sources said the US Federal Aviation Administration (FAA), which is conducting a shadow certification of the programme and is assessing the Civil Aviation Administration of China's (CAAC) ability to assess the aircraft, has played a part in pushing for further testing of the ARJ21. A FAA spokesman said the agency cannot discuss details of the shadow certification as it is still active. "We are observing the CAAC as they certify the aircraft. We will observe testing, review certification data, and observe meetings with the certification applicant; the CAAC defines the actual certification requirements," said the spokesman. Comac has said it intends to apply for FAR 25 certification after the ARJ21 passes this shadow certification, so the aircraft can be marketed overseas. je pensais qu'on faisait les essais de décrochage tôt dans le programme ? Oui, dommage qu'il n'y ait pas de zone d'essai autour du pôle Sud pour les essais d'hiver ... Austral ! Et la Patagonie, n'est pas assez "Sud" non plus, et pas assez "Continentale" ! Ce sera pour cet hiver boréal, les essais Gel et grand froid de l'ARJ 21 ??? Je crois que les Chinois trouveront la combine pour une certif provisoire chez eux ?? Moi ce qui m'inquiète c'est surtout les essais de décrochage ! Et en Chine ce n'est jamais clair ... transparence bourbeuse ... hum ?? Call it a case of being let down by one’s older brother: New delays in the certification of the Comac ARJ21 regional jet could force the development of the C919 mainline commercial aircraft to be prolonged. The FAA is insisting its shadow certification effort on the ARJ21 be completed before the agency begins work on the C919. But the C919 is already near the point at which a certification agency needs to be brought in; if the project advances much further without the FAA’s involvement, the U.S. regulator may decide it can never become involved. Moreover, Comac has shifted scarce engineers to help sort out the ARJ21’s problems at a time when the C919 is already running a few months late. Since FAA endorsement of the C919’s Chinese certification is indispensable to the international sales prospects of the 156-seat, six-abreast aircraft, the brewing crisis again raises questions about China’s decision to throw its inexperienced industry into development of a second indigenous airliner before finishing its first, the ARJ21. Indeed, the C919 was launched in May 2008, six months before the ARJ21 even flew. The schedule is unusually important to the C919—not because it is under binding contracts for delivery on time in 2016 (it is not), but because Western competition is mounting. Already Airbus and Boeing, launching the A320NEO (new engine option) and 737 MAX, respectively, have probably obviated the C919s chance to be the most efficient narrowbody in its early years on the market (see p. 26). Beyond that, the replacements for those Western aircraft, whenever they appear, will likely render the C919 obsolete. Nothing has been announced, but Comac now expects the Civil Aviation Administration of China (CAAC) to certify the ARJ21 as airworthy in September or October 2012, says one industry official. Another executive involved in the program thinks 2013 is more likely, 11 years after the project began. Comac has yet to officially acknowledge the latest delay to the ARJ21 program. Its last announcement on the matter was that certification would be achieved by year-end. This date already represented a delay from the original, admittedly ambitious, objective of 2006. Strictly speaking, the FAA’s role is to validate the CAAC’s process, not the aircraft itself. But officials say the U.S. agency believes it can only be satisfied with the process if it follows it all the way to the end in this test case; only then can the C919 effort begin. A spokesman for the FAA declined to comment. The CAAC is taking a properly tough line with Comac, says an industry official. There is not the slightest hint of a national regulator going soft on a national-champion manufacturer. In one instance, says another person close to the program, Comac was slow to recognize that a major ARJ21 part had failed a test, even though it very obviously had. Then the company hoped simply to repeat the test. The CAAC insisted on a redesign. Assuming that regulatory involvement in the C919 design should begin about now—and that the ARJ21 can be certified according to the new, unannounced time table—then the C919 will be pushed back by a year. Some of that delay has been incurred anyway, since the project is now running a bit late. Moreover, Comac has built a year of slack into its schedule. First flight is due in 2014 and first delivery in 2016, allowing two years for certification flying instead of the usual one. A year’s delay would eat up all of the reserve time, leaving the program exposed to more of the delays that have accumulated so far. While an industry official familiar with the C919’s design says it will not have the faults of the ARJ21, the latter aircraft’s track record does not bode well for rapid certification flight tests. The ARJ21’s faults have included problems with the flight control system and an aluminum-alloy wing that broke before reaching its ultimate load. Flight control issues have resurfaced and avionics suppliers Honeywell and Rockwell Collins have been asked to change their equipment, not because it did not meet the specification but because a regulator, perhaps the CAAC, was not satisfied with the specification. Ce qui est sur c'est que les chinois sont en retard. C'est certain que ça aura des conséquences sur le C919. The Commercial Aircraft Corporation of China (Comac) ARJ21-700 regional jet is ready to enter the type inspection authorisation (TIA) stage, nine years after the project began. Comac said in a statement that the aircraft had undergone several airworthiness certification flight tests in 2011, completing the preparation before it enters the TIA stage. This is likely to be the final stage before aircraft is handed over to the Civil Aviation Administration of China, which is responsible for awarding the type certification. The US Federal Aviation Administration (FAA), on the invitation of both Comac and the CAAC, is also conducting a shadow certification of the ARJ21-700. Comac wants to apply for FAR 25 certification after the ARJ21 passes this shadow certification to market the aircraft overseas. Launch customer Chengdu Airlines was due to receive its first aircraft by end-2011, but the ongoing delays in the certification process means that this has been pushed back by up to a year. China's first passenger jet, the 90-seat ARJ21, is unlikely to get regulatory approval before 2013, an executive of its producer said on Thursday, putting it about five years behind its makers' original schedule to win certification. The delay could also disrupt the completion of a more ambitious effort to develop a 168-seat C919 jet aimed at breaking the global dominance of similar-sized aircraft by Airbus and Boeing. Tian Min, chief financial officer of the state-controlled Commercial Aircraft of China, or Comac, which is developing both aircraft, said a final certification of the ARJ21 by Chinese regulators has been pushed back to 2013 from an original schedule for completion by 2008. Tian, speaking on the sidelines of a conference in Beijing, declined to go into details when asked the reason for the delay, simply saying: "It is a process." The ARJ21 is a regional jet with a range of about 2,000 miles aimed at midsize markets. Industry insiders - including executives of technology suppliers to Comac - said any delay in the ARJ21 would likely disrupt the C919 as well. But Tian said the bigger aircraft was on track for a 2014 maiden flight and should get airworthiness approval from the Civil Aviation Administration of China, or CAAC, as scheduled by 2016. Tian's comments follow an announcement by Comac in February of a new round of airworthiness tests for the ARJ21, which Comac designed to compete with Canada's Bombardier and Embraer of Brazil. Comac said on February 29 that the first CAAC certification flight test took place that day. It said a version of the jet, the ARJ21-700, "piloted jointly by a COMAC pilot and a CAAC pilot, successfully landed after nearly two-hour flight". 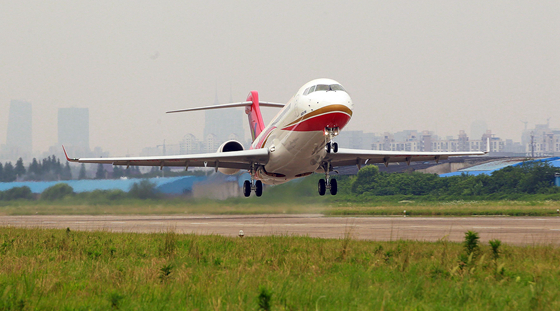 The successful test flight "indicates that the CAAC certification flight tests for the first indigenously developed jet have formally kicked off, and the ARJ21-700 aircraft certification process also entered into a new phase", it said. 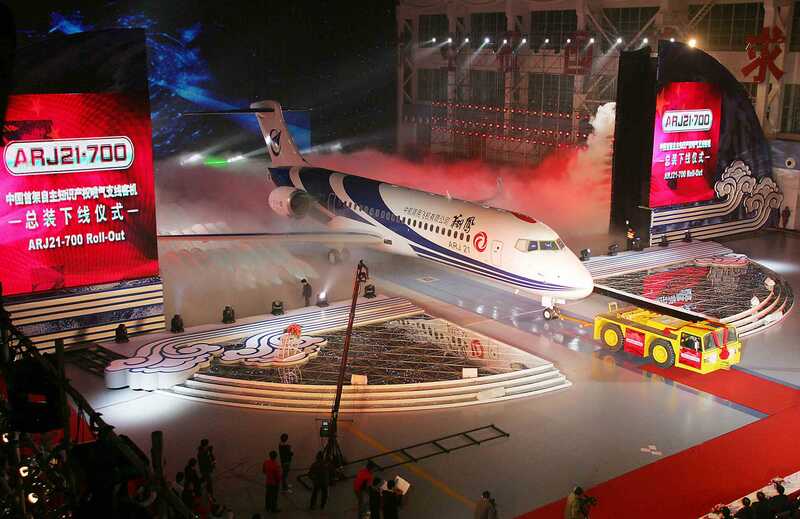 The ARJ21 is key to China's bid to develop an aerospace industry that can compete globally. By starting with a smaller jet, China will stay out of the competitive sights of Boeing and Airbus for now, but will enter a market crowded with established players as well as recent entrants from Russia and Japan. Liebherr doit revoir son train ... suite à qq modifications de l'avion ! L'ARJ 21 ressemble de plus en plus à un exercice de style pour débugger les COMAC Co, afin de ne pas trop se louper avec le C-919 ! Un tour d'échauffement, en somme ! Comac's ARJ21 regional jet is unlikely to receive certification until at least late next year, according to sources. had first delivery scheduled for 2007, will again be delayed. was validated by the US Federal Aviation Administration, he added. first time, and is unfamiliar with the process, sources say. and critical tests of the programme. airframer's lack of experience and small talent pool. Comac has so far garnered 252 commitments for the ARJ21, mostly from Chinese airlines and leasing companies. Le premier ARJ21 en livrée client, Shengdu Airlines sera le premier à en recevoir un plus tard cette année. Cet appareil n'a pas volé encore. Bon je le met ici, vu que le C-100 y est ?? 12 Ans après son lancement ! 400 cdes ... fermes ?? Hum ? Et autre nouvelle, les Russes vont aider COMAC pour le C919 ... l'avion serait prête pour 2018 ! S'ils sont sur le point de le livrer, ça doit être fait pour la Chine, pour l'export c'est peut être un PB à terminer. et le 6e exemplaire a volé pour la première fois hier. COMAC débute les essais sur des routes simulées, la certif est pour bientôt. Certification pour la fin d'année (de mémoire, article Aweek). Probablement uniquement chinoise, il semble que la shadow certification avec la FAA n'ait pas été menée au bout (ou en tout à la même vitesse). Les essais en vol sont terminés, ils sont prêt pour la certification. A suivre ... le plus dur commence non ? L'autorité de certification chinoise (CAAC) a émis le certificat de type.